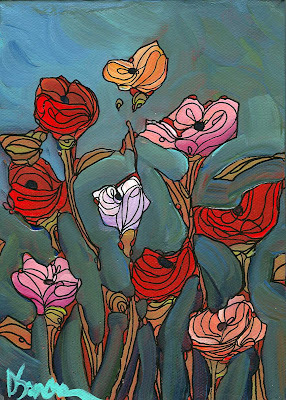 I posted this new painting last night but blogger was checking for spammer, so they locked up the blog until this morning. Sorry about that! 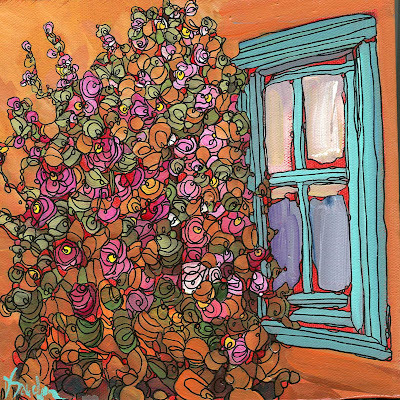 I wanted to paint something really warm and I had a photo of an old turquoise window so I added a wild mass of hollyhocks to complete the painting. I like it! 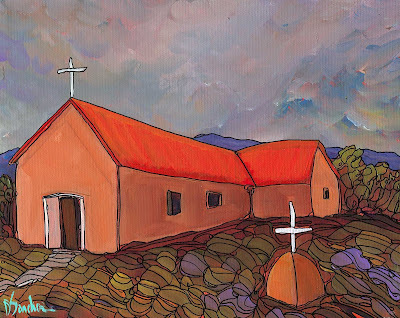 I painted this church for a friend who is making a small collection. 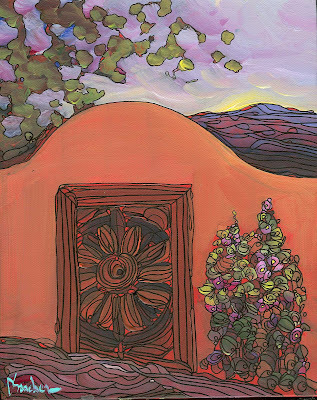 I shot a photo of it when I was on a paint-out up in Taos and I can't remember where it was! 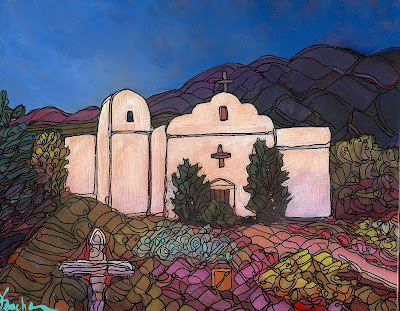 It was either on the south side of Taos near Ranchos or in Arroyo Hondo, I think. I took over 400 pictures, and I should've written down the name of this beautiful church. If anyone knows, please email me. I am calling it "CINCO" because it had five beautiful crosses. 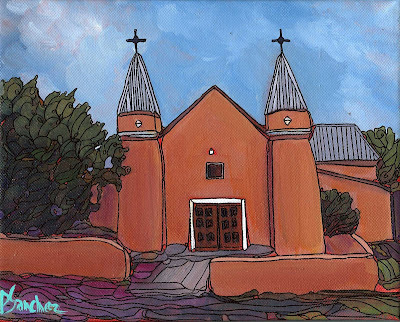 This little painting is a continuation of my New Mexico Church series. 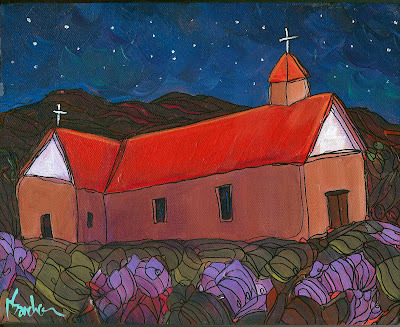 We don't often get a chance to see these churches at night, so this is what I think a northern sweet adobe church at night should look like. Please click on the payPal button below for purchase information. I have lived about a mile from this church, walked to it, and watched Matachines dance there. It's very cool. 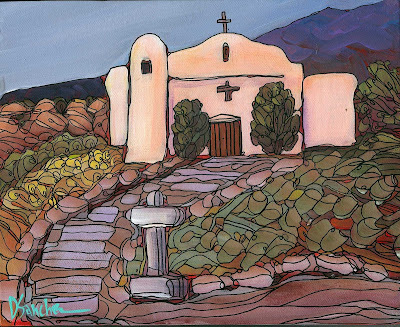 This is my favorite New Mexico church, Santuario de Chimayo. This is a beautiful old church - San Isidro, I believe. I'm not sure if it's still used for Mass anymore, but they still have lots of events; art exhibitions, concerts, lectures, etc. 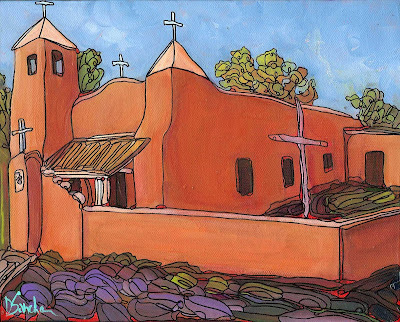 I believe the Corrales Historical Society hosts a re-mudding of the outer adobe walls each year. The photo I took was in late evening, so there wasn't a lot of light to work with. I like it, I hope you do too. 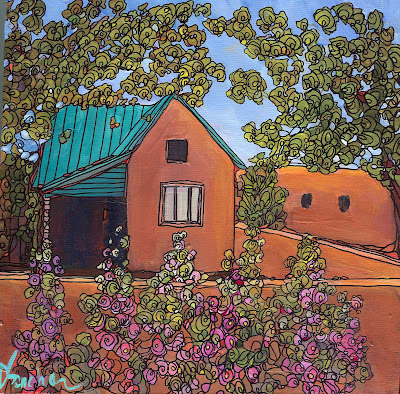 Madrid, New Mexico is on the backroads between Albuquerque and Santa Fe. 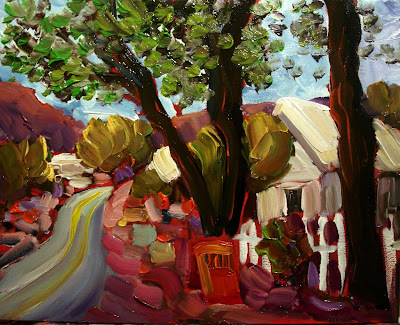 It was a big mining town back in the day, and now it's a hip, artist community. It has an old mine shaft museum, a cool old bar, lots of art activities, and really cool old houses. Rumor is, it's also home to quite a few outlaws. It's also been the scene to several movies, including "Wild Hogs." Every year at Christmas, they have horse-drawn buggy rides, the whole town lights up and it's just really beautiful. I snapped a photo of this house on a paint-out last year. I was driving with someone else, so it was just out the window, but I love how funky it looked. 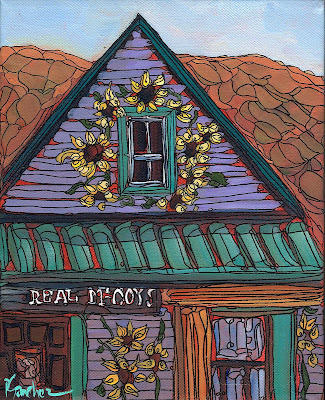 It also was loaded with painted sunflowers and since sunflowers were kind of where I started, I had to snap it. I'm headed back up there for another paintout this coming weekend, so I will see if it's still there and take another pic. Hope you enjoy! For those of you interested, I am starting my personal journal again, which may be read by visiting the link below. There is also a link on the site to sign up to get daily journal postings. Thanks! What a wild, crazy day! I got to the gallery at about 9:45am. People had been lined up at the door since 4am this morning, some even bringing chairs. We auctioned off one of my paintings outside, which was totally fun. The doors opened, people rushed in, and they just grabbed painting after painting off the wall. By 12:30 most of my paintings were gone. I met a bunch of nice people, some old friends, and had a blast. Tomorrow, it's back to daily paintings and planning for Artfest. 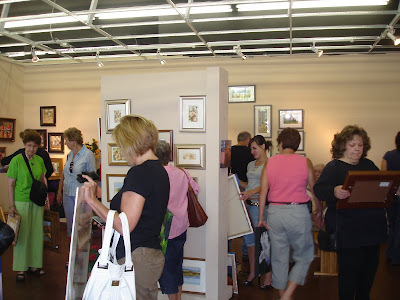 Wow, the summer show and sale is tomorrow. I can't wait, it's so fun. I am almost done cleaning my studio - oh my gosh, so much dust hiding! 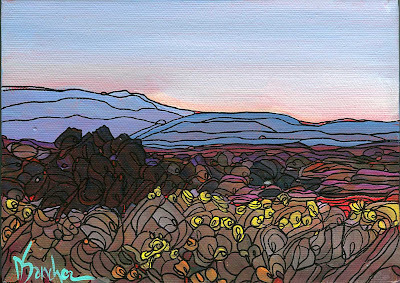 This painting is something I started when a couple came to watch me paint at my studio. This is just the underpainting and it's been sitting in the studio staring at me for about a month or so. Maybe now, I will get around to finishing it! Stay tuned. No daily painting tonight, it's my husband's birthday. Tomorrow is the show. I will take some pics to post tomorrow night. Enjoy the weekend! 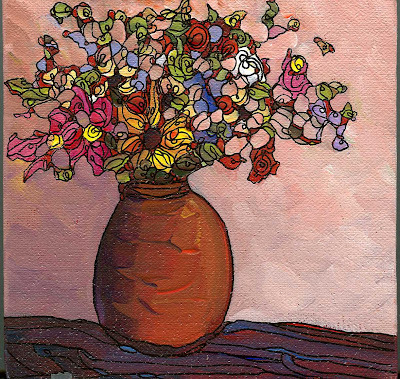 I don't normally paint many still lifes, mainly because I don't want to take the time to set up elaborate displays and worry about flowers dying, etc. I just made this one up and it's painted on linen, which gives it a very rich feel. Linen has wonderful texture. 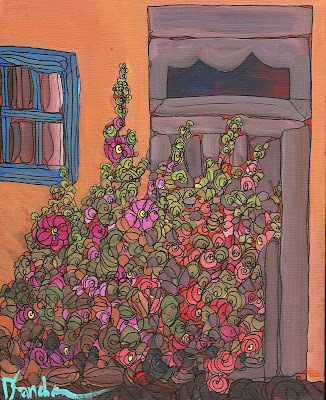 The background is light and airy, which is also something I don't normally paint. I guess I'm not feeling "normal" today. I am really enjoying these churches. 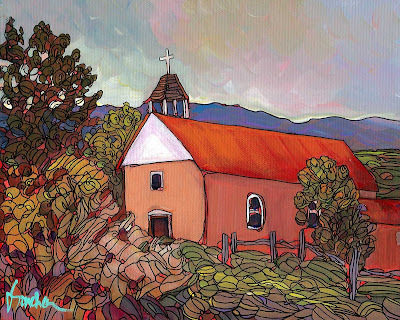 I like how the blue mountains and sky contrast with the vividness of the church's tin roof. And the white crosses just popped out at me, that's the first thing I see. 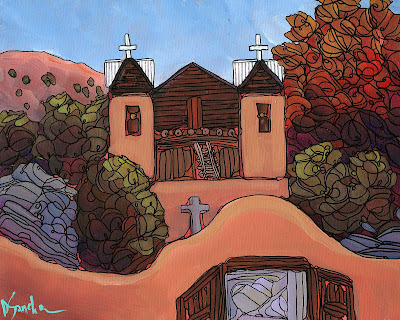 These little churches all feel like autumn in New Mexico to me. It's so warm outside, I'm ready for that time of year. 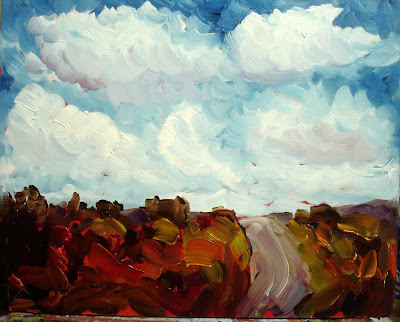 I can't wait to go out in September/October and paint chamisa! I'm still painting for the show Saturday, probably will put in a hard three days, and then a short vacation. 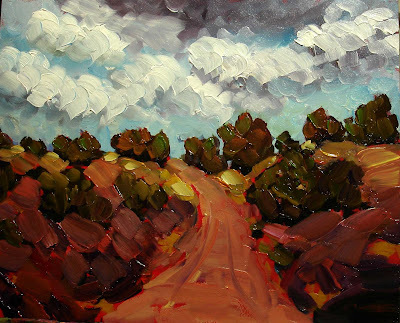 I did a demonstration at my recent show and several people expressed an interest in this painting when it was completed. 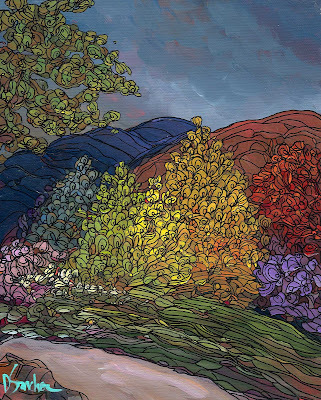 It is now finished and I am offering it for viewing before it goes to the gallery. If you are interested, it will be on display here for three days. 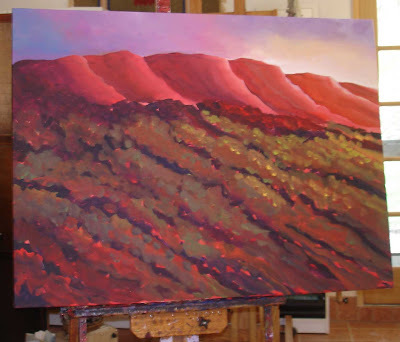 Email me if you are interested in receiving more information or viewing the painting in person. Here is the second in a series of churches you asked for. This one is for sale! This church has that nice orange glow that happens right around the time between sundown and nightfall. You can see the last light of day through the clouds on the left and it looks like a storm could be rolling in. Please see Paypal below for purchase information. I will try to paint a couple more daily paintings this week. Most of the work I'm doing now is for the Weems show this Saturday. Here is the info: Please come by if you can - I'll be there and it's so much fun! Good morning! I'm getting ready to run an errand and then it's "paint time"
Hopefully, I may have a daily painting to post tonight. Another work in progress for the upcoming Weems show. Today I'm going to run to the Los Ranchos Lavender in the Valley festival to see if I can get a nice photo of the lavender fields and see what events they've got going on. Then I'll be back in the studio the rest of the day. I'll have another work in progress post tonight. Enjoy your weekend! 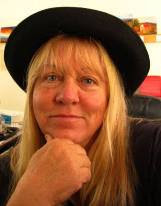 I am working like crazy on a series of paintings for a one day show and sale at Weems Galleries coming up on July 19th. Crunch time! After that I can breathe for a day or so. 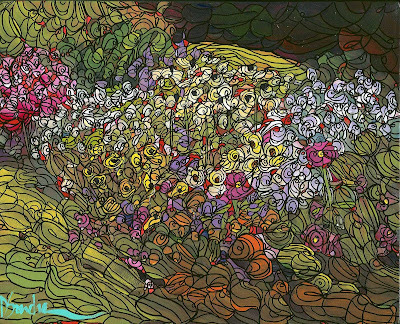 This piece is just a wild jumble of flowers, my favorite subject matter. These paintings are not available for pre-purchase. 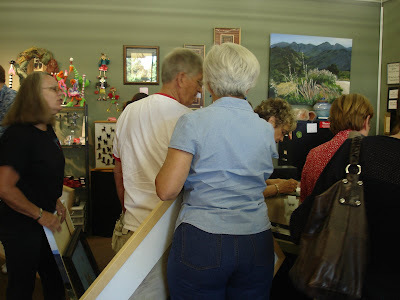 You have to be at Weems Gallery when they open at 10am. People line up starting the night before and it's so fun! Very wild and crazy! There are about 12 artists who participate and we have a blast. 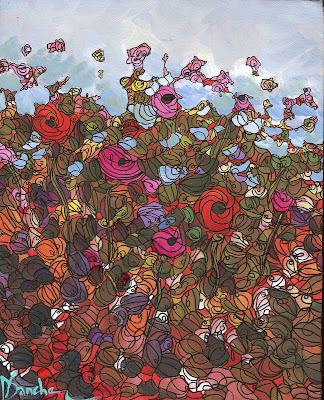 Doesn't this painting feel like eye candy to you? 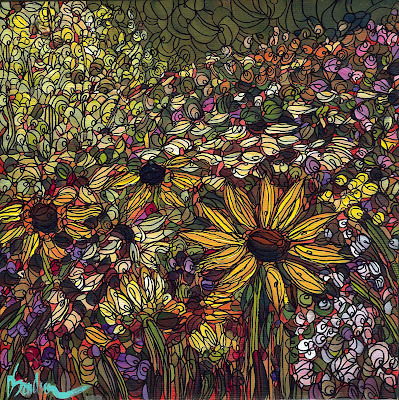 I look at it and I can see so much movement through it, especially around the top of and through the yellow flowers. This was fun to paint and although I had to spend quite a lot of time outlining, I think the end result was worth it! This little scene reminds me of fall in New Mexico. It has been so hot and muggy here that I'm already looking forward to September and cool crisp, mountain air. 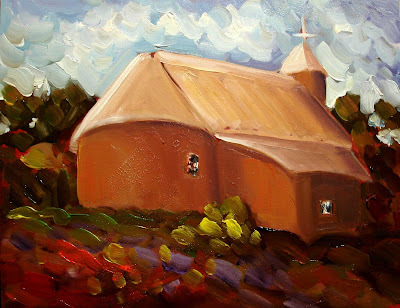 Everyone has been asking for church paintings, so here is the first one and you will see more sprinkled thoughout the blog periodically. If you have more thoughts on subject matter, leave your comments, or email me. I'll be happy to consider ideas! I was going to put this piece up for auction on ebay but it didn't work out, so I guess it's up for grabs. I took a few days off this weekend to just relax and I'm trying to get back into it. I have about 30 small canvases to work on for the upcoming show on July 19, so you will see random little paintings available for purchase every few days, although probably not daily. 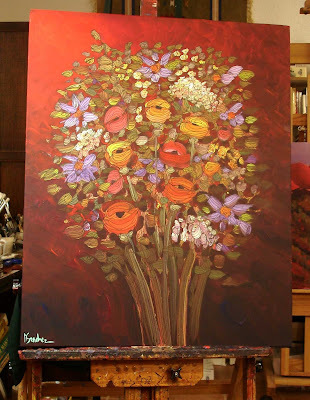 I also have a 30"x24" bouquet on a red background that I want to finish in the next couple of days. Where does the time go?? This was a quick painting done from a photo I took a long time ago. 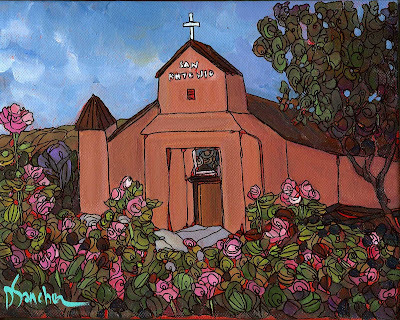 It's the sweet little church on the hill at Golden, New Mexico. It was a beautiful whitewashed adobe finish at one time. Now, it's been plastered adobe color and cream and has a big chainlink fence around it, so you can't get pictures like this anymore. I didn't even sketch it, just started paintting so it's totally not to scale and I added lots of color to the foreground. 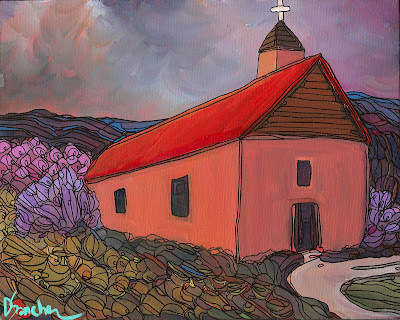 I like my little whimsical church! I always think of sunflowers as happy and festive, thus, the title. I love doing the suns in sequences of five, for some reason, it just looks right to me. 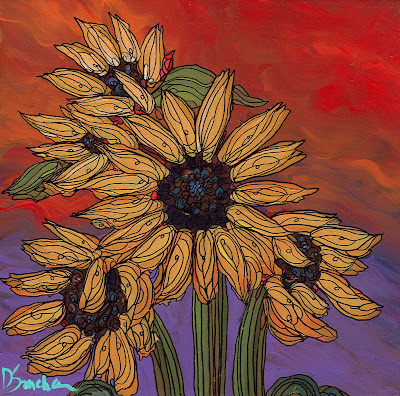 When I first started painting, sunflowers were the first subjects I painted. I painted so many that I got tired of them, so I would choose other things, but eventually I would come back to this beautiful flower. I've grown them, and they start out so small and eventually grow over your head. They turn to follow the sun, and come in so many colors. When they were spent, I would cut the big heads for the birds - plus roast a few seeds for us. Wow, I am sure missing my garden right now....anyway, I hope you enjoy these festive beauties.